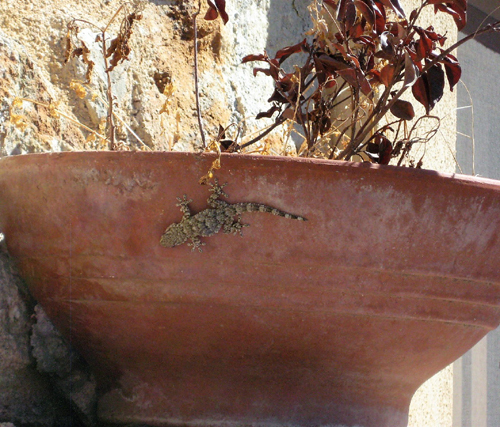 They are called Levante and Ponente - Alessandra‘s two small, lovely houses at the very edge of the municipal area of Marina di Pisciotta. The bright quarry stone façades of the semi-detached houses, which were completed in 2017, harmonize perfectly with the typical lush green of the Cilento, which surrounds them. A large sea view terrace in front of the entrance of each house reflects the coloring of the façade. 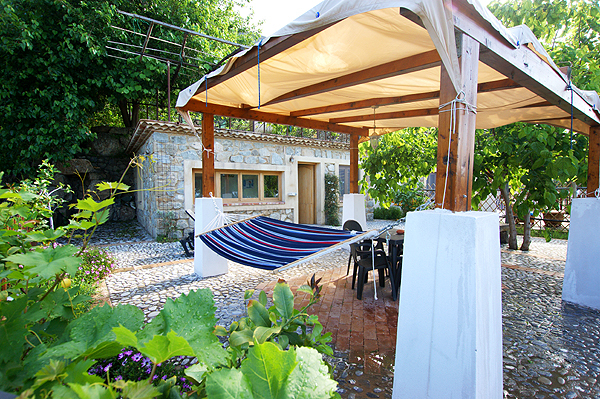 A pergola, a sun sail, a hammock, loungers, flower beds ablaze with colors and, in the midst of it all, a lush mulberry tree make for cozy atmosphere under a bright blue sky, which you must seldom do without in the Cilento. Casa Levante is the semi-detached house to the right. As its name suggests, it faces east and therefore captures the morning sunlight. 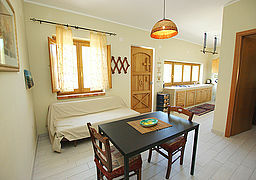 The house includes a combined kitchen-living-dining room, two bedrooms and a bathroom. 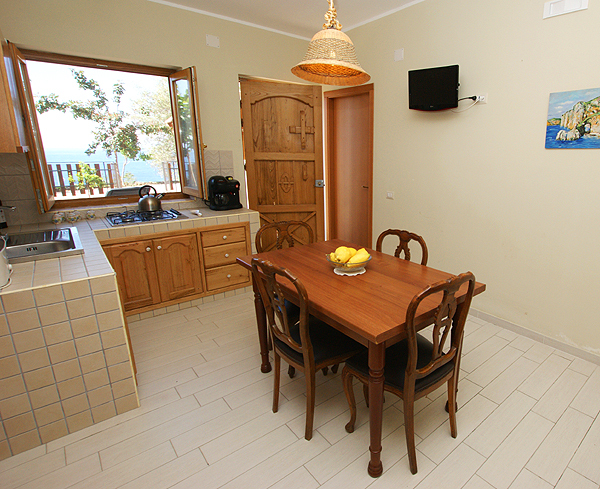 The kitchenette is to the right of the entrance. 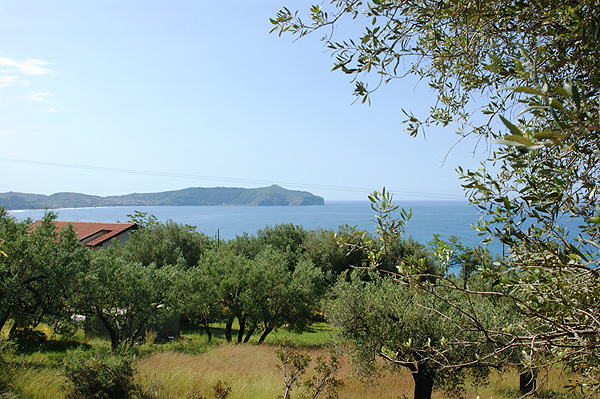 While preparing some fresh 'summer' pasta with sun-ripened tomatoes and fragrant basil at the gas stove, you can, every now and then, let your gaze roam across the blue waters, as the large window opens onto a view of the sea. The sea is only ca. 200 m from your accommodation as the crow flies. The kitchenette also includes refrigerator with freezer compartment, coffee machine, microwave, toaster and water boiler. 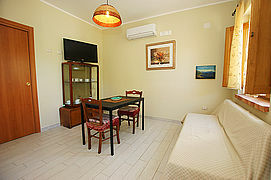 Furthermore, the room is furnished with a dining table and four chairs, a sofa and TV. 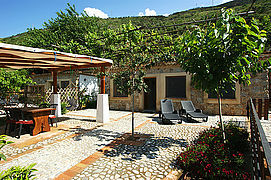 The double bedroom of Casa Levante is to the left of the entrance. 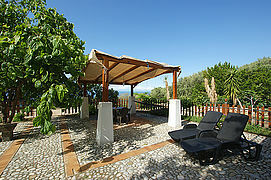 It is furnished with air conditioning and its window opens onto a view of the sea, too. The second bedroom with twin beds and sea view window is located to the right of the living-dining area. 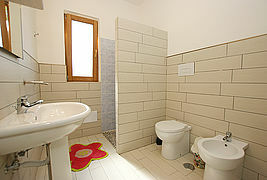 The bright and modern bathroom is equipped with masonry shower cabin, WC, bidet and hair dryer. Casa Ponente, the smaller semi-detached house to the left, faces more towards the west. 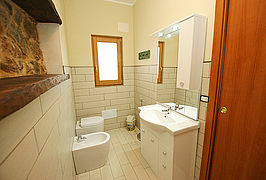 It includes a double bedroom, a combined kitchen-living-dining room and a modern bathroom with shower, WC and bidet. The row of windows above the masonry kitchenette looks out onto the beautiful terrace of Casa Ponente and the sea beyond the olive trees. 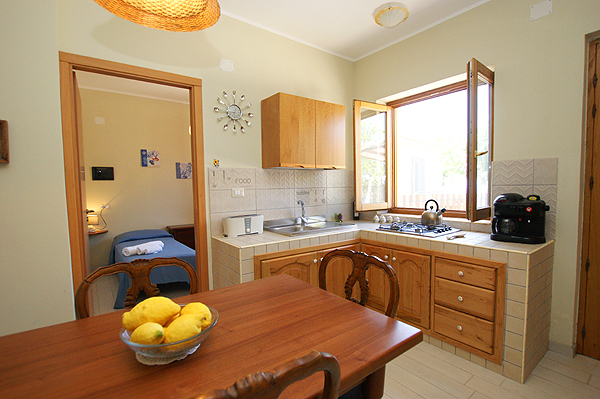 The kitchen includes refrigerator with freezer compartment, microwave, water boiler and 4-burner gas stove. The adjoining living area is furnished with a small dining table and two chairs, a sofa, a TV and air conditioning. 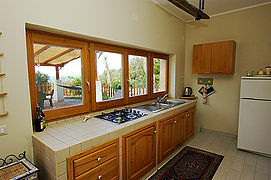 Except for the kitchen windows at Casa Ponente, the windows of both houses are furnished with fly screens. Both Casa Levante and Casa Ponente include an outdoor shower, which is screened from view, and an outdoor grill as well as free WLAN. There is a washing machine in the outdoor area for shared use by the guests. Each house comes with a reserved and shaded parking space, which is located at the end of the short access road, about 20 m from the accommodation. 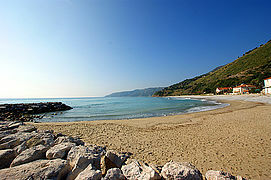 The nearest sandy beach and bathing spot is found at Marina di Pisciotta, about 2 km from Le Case di Alessandra. Only a bit farther off (ca. 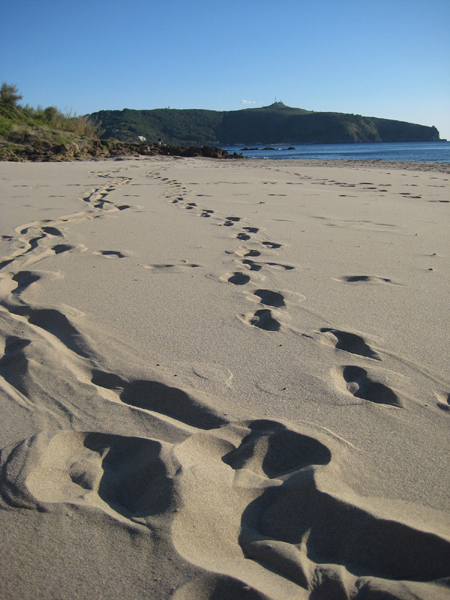 2.5 km), towards Caprioli and Palinuro, lies the long, fine sandy beach of Saline, from where you have got a great view of the Cape of Palinuro. There is a supermarket at Caprioli, ca. 2 km off. 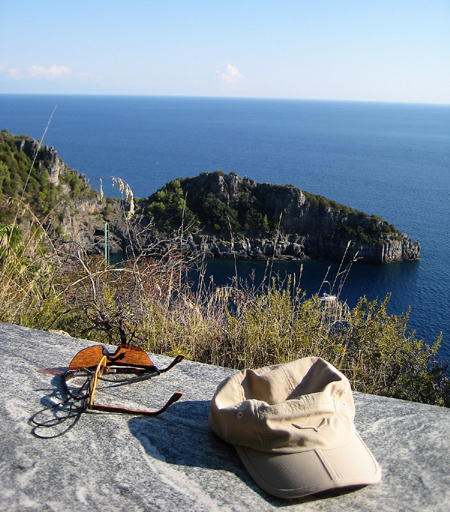 However, shopping can also be done year-round at Pisciotta and Palinuro. At the lungomare (seaside promenade) of Marina di Pisciotta, there are several restaurants and bars, amongst others hotel-restaurant Riviera of owner Alessandra. As of May, you can have lunch and/or dinner there every day. 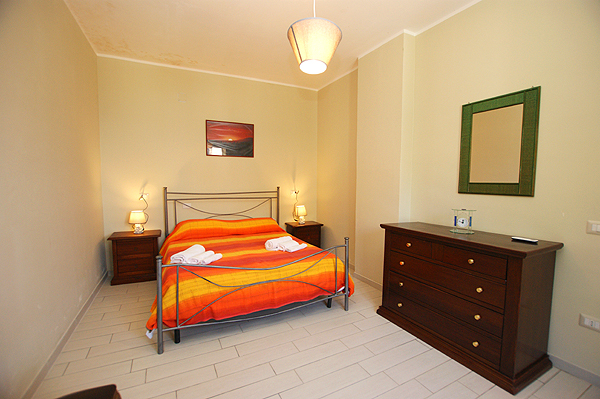 Le Case di Alessandra are located above the railroad track and only about 1 km from Pisciotta-Palinuro train station. Le Case di Alessandra: Levante (to the right) and Ponente (to the left). 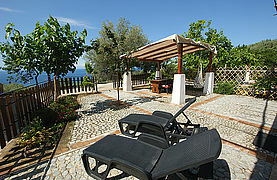 Great sea view from Casa Levante. 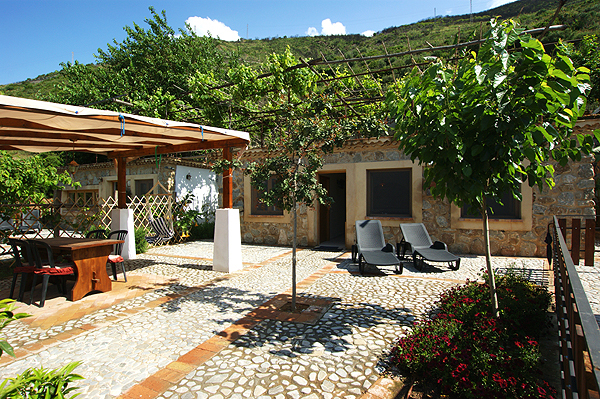 Large and cozy – the terrace of Casa Levante. Cooking and enjoying the view of the sea at Casa Levante. 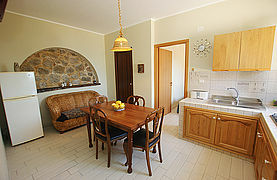 The kitchenette of Casa Levante. From the combined kitchen-living-dining room you enter the two bedrooms. 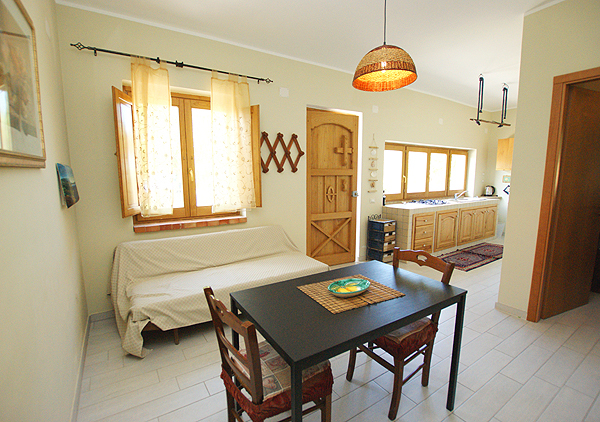 Living area with dining furniture, sofa and TV at Casa Levante. The entrance doors of both houses have been crafted the traditional way. 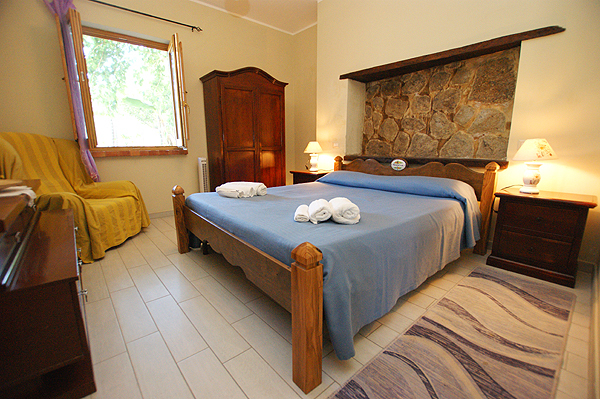 Glance into the double bedroom of Casa Levante. 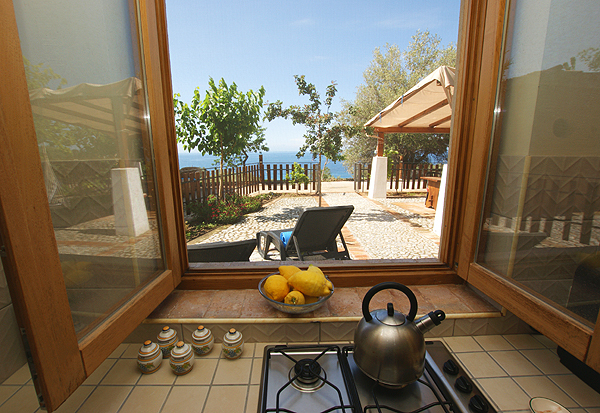 The window opens onto a view of the sea. The second bedroom of Casa Levante with twin beds and a window facing the sea. 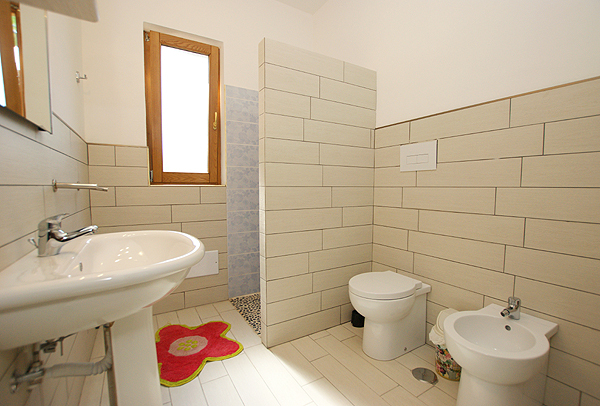 The bright and modern bathroom of Casa Levante with masonry shower cabin. From Le Case di Alessandra your gaze roams as far as Capo Palinuro. 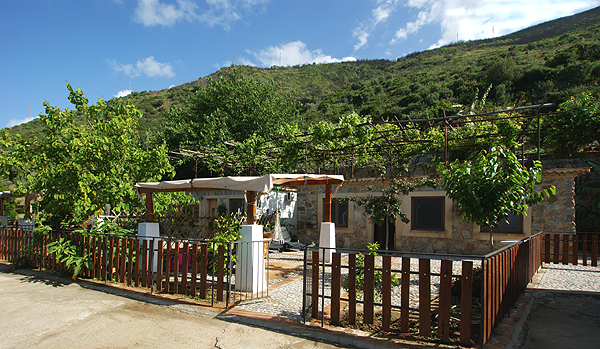 Casa Ponente – the smaller holiday home. 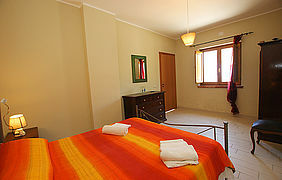 In the cozy bedroom of Casa Ponente. 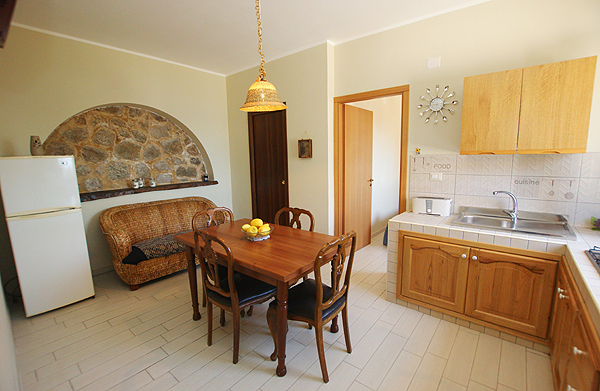 Friendly and bright – the combined kitchen-living-dining room of Casa Ponente. 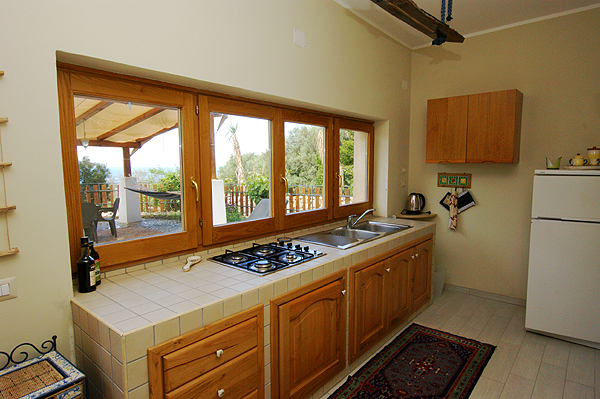 Facing the sea: the row of windows in the kitchen area of Casa Ponente. 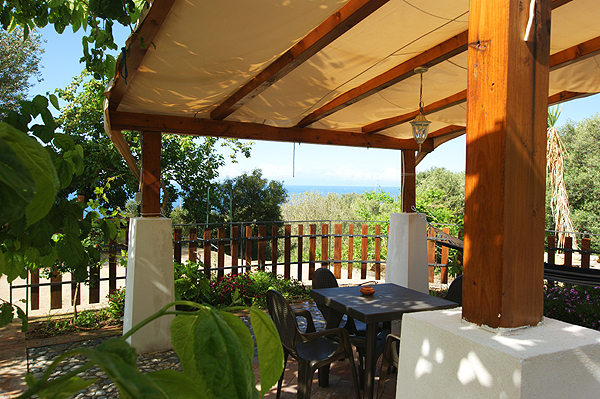 Shaded dining area on the terrace of Casa Ponente. Glance into the modern bathroom of Casa Ponente. 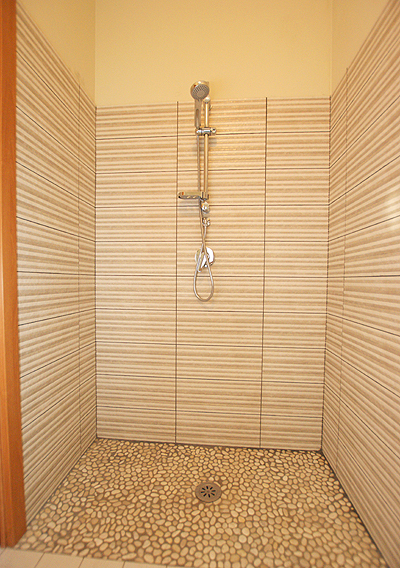 Shower in the bathroom of Casa Ponente. 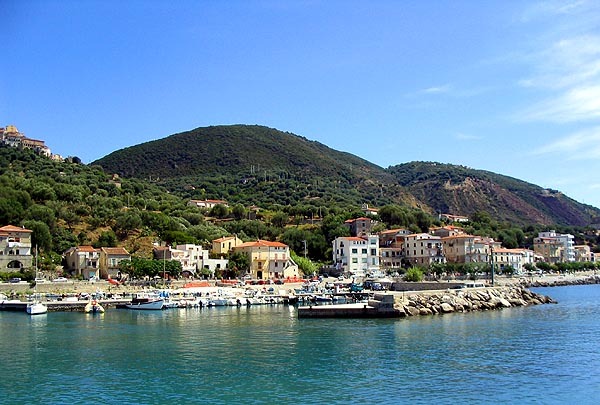 The fishing village of Marina di Pisciotta is ca. 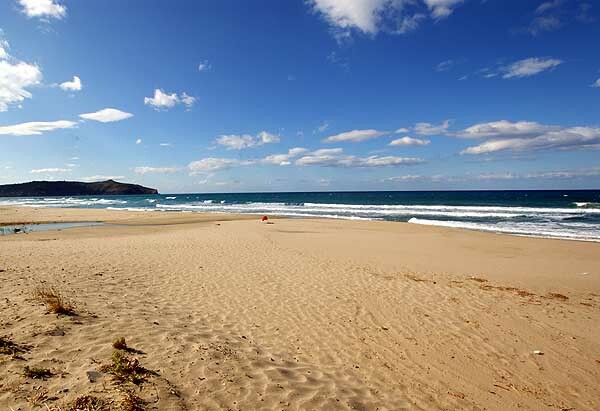 2 km from Alessandra's holiday homes. 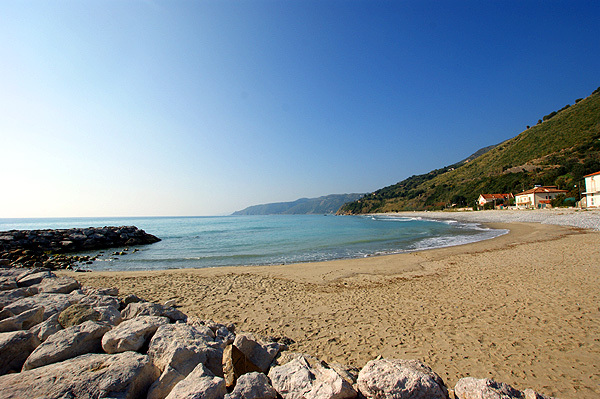 Calm and leisurely atmosphere all year round at the beach of Marina di Pisciotta. Days of arrival and departure: flexible. From July – September only Saturdays. Max. 4 persons, 200 m to the sea, 2 bedrooms, Pets upon request. Max. 2 persons, 200 m to the sea, 1 bedroom, Pets upon request.